This is, as handily scrawled above, Utatsusaurus, one of the basalmost known ichthyosaurs. The general outline is basically lifted straight from Ellis' excellent pen-and-ink representation, though I opened the mouth, switched up the colors (I think it looks rather like a penguin here) and added the "back" flippers. For being so basal, I think Utatsusaurus is very much an ichthyosaur. Are there more basal ichthyosaurs known now? I know that Grippia and Cymbospondylus are supposed to be pretty low on the ichthyosaur family tree, but I've never been all that educated on the phylogeny of the group. Here is a rather cartoony Nothosaurus. I know, the proportions are all wrong, but I like how intent he looks. I think that nothosaurs and pachypleurosaurs are interesting in that they're essentially pre-plesiosaur sauropterygians, but all three groups co-existed at one point, so they were all doing different things. And they all mix and match body parts, too. Definately some modular evolution going on in that group. It's also interesting that while placodonts are sauropterygians, they look NOTHING like plesiosaurs and their allies. Actually, if one of you in Readerland is an expert on plesiosaurs and pliosaurs, I've got a quick question: at one point, I know that the two groups were considered separate, but I remember reading somewhere that, in fact, some former pliosaurs are actually plesiosaurs, and some former plesiosaurs are actually pliosaurs, and that the separation between "plesiosaur" and "pliosaur" is actually very superficial and does not adequately reflect the phylogeny of either group. Is that true? The work of F. Robin O'Keefe is probably most relevant to the question of "plesiosaur" vs. "pliosaur" polyphyly. Check out his pubs here; the 2002 paper is most of interest. while i'm no expert, the two experts i've talked to on the subject (i'm a bit of a marine reptile junky) stated different but interesting opinions. before i state their difference in opinion, what they agreed upon was this. 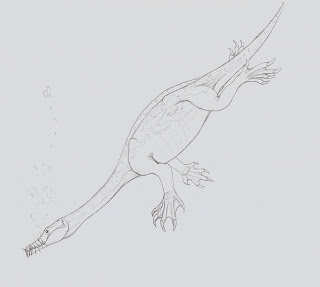 long and short necked plesiosaurs were never continuous groups. throughout the mesozoic any line that had one neck size was typically evolving into the other. so you ended up with a state of flip flopping every few 10-20 million years. this i find very interesting, but have never found a good paper on. the late Dr. Betsy Nicholls was of the opinion both families were arbitrary and all members are part of one group. her grad student (whose name i can't remember off the top of my head, but he works in northern alberta) thought there was some validity to the names, but there needed to be a major revision of the whole group to find new defining character. which he was certain would require the erection of several new families to cover the odd radiation seen in the group. i don't have any papers on the subject. i would love to read them! i did try to find them. sadly Dr. Nicholls grew very ill my first year at the Tyrrell, and thus was not avaliable for questions like the other curators. (i was extremely lucky, and saw her at her last public talk before her passing). i only met her former grad student once at a conference. let me know what you find out. this is a subject that interests me a lot too. Goddamnit, Andy beat me to the punch. Robin O'Keefe has done the most work on this problem, indeed. The 'pliosaur' vs. 'plesiosaur' dichotomy has a lot to do with ecomorphotypes and assumptions made by pre-cladists. Well I see the "plesiosaur/pliosaur" issue has been adequately covered already. I'm trying to train myself away from "basal" (see here)--but Utatsusaurus is indeed one of the basalmost known ichthyosaurs (along with Parvinatator and the Grippia+Chaohusaurus group. Also, plesiosaurs sensu stricto didn't coexist with nothosaurs and pachypleurosaurs, but their likely ancestors, the pistosaurs did.